Bosky Khanna is Staff Journalist, Citizen Matters. Mayor B S Satyanarayana says his aim is to reduce the garbage in the city by end of his term. 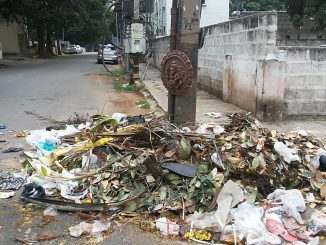 Garbage-free Bengaluru? Nope, not yet! Here’s one reason why: BBMP doesn’t pay the contractors; and they don’t want to do a good job! The Akrama-Sakrama bill has been thought of for a long time now. It even has got a nod from the governor, but implementation is still taking a long time. What is the confusion? Here’s a peek. Theatres to multiplexes: An inevitable transition? Theatres are making way for multiplexes. Changing nature of the crowd, geographic location, type of movies, facilities offered, ambiance, technological innovations – everything plays a role in the way film industry works. Most people in Bengaluru for whom spending an extra Rs 4,500 per year is not at all problem, still want Aadhaar card for the LPG subsidy it can provide. There are no rules after all, in India, that stop the rich from claiming LPG subsidies. Election Commission plans to rope in student coordinators to enroll more and more students. Efforts are on to rope in E-Governance Department for issuing forms at all Bangalore One centres. The state Police Complaint Authority has been formed in September, after three years of stoic silence on the issue by the government. However, it has no staff, not all members are appointed and it hasn’t started investigating cases. Justice Puttaswamy, who filed the PIL against UIDAI in Supreme Court, says that Aadhaar card needs to be converted in to a Citizenship Card like in the USA, to keep a check on illegal migrants. Not many in Bengaluru know about weekly Santhes happening on the outskirts. A visit to a Santhe could be a refreshing experience, along with buying fresh vegetables for best price. GPS-enabled smartphone can be your best friend in crisis. It can send SOS messages and calls during crisis, and send your location details to your prime contacts – just with the help of an app. Cattle in some parts of the state have been affected by Foot and Mouth disease, and Animal Husbandry department has declared an outbreak. People who consume meat are advised to take sufficient care. A resident who doesn’t want to be named says that repeated complaints made to the board, forced KSPCB officials to conduct a spot inspection and issue a show cause notice to the erring Pallavi Engineering company.